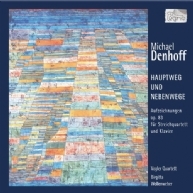 Michael Denhoff is obviously not content with small forms: after his cycle Hebdomadaire. 52 pieces of the year for a pianist, he refined the temporal range and proceeded from weekly works to daily miniatures, which he then expanded to monthly pieces. Archaic sounds, songs as psychodramas, plowing through the depths and shallows of the orchestra: experience Globokar’s cosmos of original, intense music. A melange of works by Dieter Buwen, Ryo Noda, Theo Brandmüller and Alain Voirpy!